The euro dollar bulls were out in force yesterday, with the 40 day moving average once again providing the trigger for a strong bounce higher ( as suggested in yesterday’s market commentary for the euro vs dollar) with the trading session ending with a wide spread up candle, which perched neatly on this key technical indicator, and providing us once again with a strong clue that that current bullish momentum remains firmly in place. In addition it is also interesting to note that yesterday’s low also found good support from the recent sideways consolidation in the 1.47 price level, ( as for Wednesday) which also confirms this technical analysis, and the only negative aspect at present is the fact that the close of yesterday failed to have sufficient momentum to breach the 9 and 14 day moving averages which have now crossed. 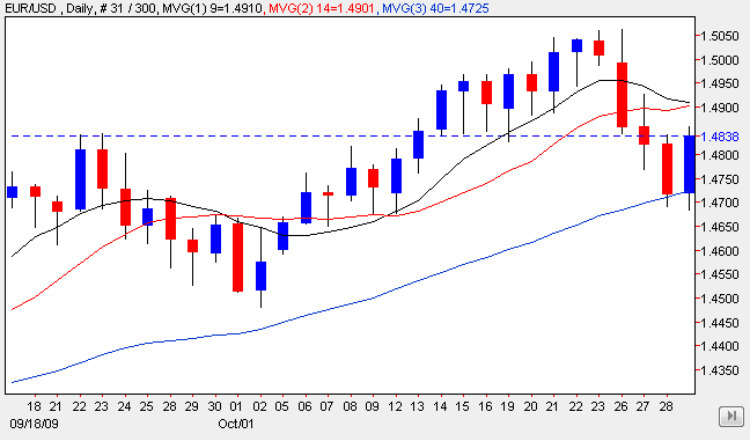 Indeed this has given us a mildly bearish signal in the short term in the form of a bear cross, and whilst the general tone remains bullish, we do need to consider this aspect of the daily chart carefully whilst trading over the next few days. The overall flavour nevertheless remains bullish, but until we see this bear cross reversed and a break and hold above the recent top at 1.50, then we cannot be certain that the trend will continue until these two events have occurred. Should we see a break above this price handle in due course, then the moving averages will unwind once again, opening the way towards our medium term target of 1.55 for the euro vs dollar pair once again.